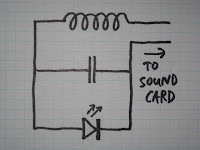 I'll be running a software radio workshop at ToorCon in October. 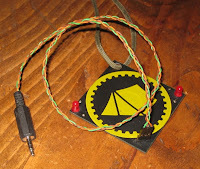 It will be similar to the workshop at ToorCamp but with more electricity and less volcanic ash! 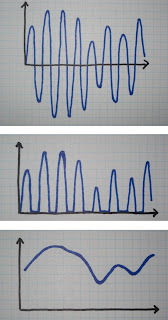 With a more pleasant environment and more structured lessons, a greater amount of material will be covered. video (179M) of my presentation with Dominic Spill at ShmooCon 2009 has been posted. Video (warning! 283 MB!) of my talk, Software Radio and the Future of Wireless Security, at Black Hat USA 2008 is now available along with all the other presentations from the event. 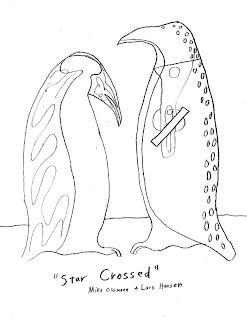 After four years of developing tools and techniques, three gloves and mittens cut by angle grinders, two broken slabs of ice intended for moving parts, one tool confiscated by the TSA, and zero broken beaks, we completed Star Crossed. 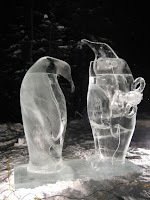 The sculpture features a realistic penguin on the left and a mechanical penguin on the right. 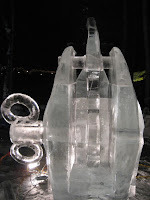 It is the first working mechanical ice sculpture that we have completed in the Single Block Classic. 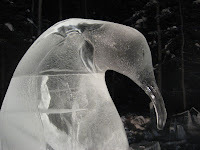 The head of the realistic penguin is shown in this detail photo. We used two textures: scratched and transparent. This shot shows the mechanism on edge. The head piece rotates on the upper axle and has a long slot that extends downward. The key on the lower axle turns a cam with a lug that rides along the slot. You can watch a video of the mechanism in action. We carved Star Crossed in three days and had a great time doing it. 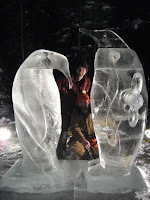 Thanks to all the volunteers and sculptors at Ice Alaska who make the experience a fun one every year. Thanks to Sharon Hansen for the shooting the photos and video. Throughout the final day of competition we worked primarily on converting the rough penguin bodies into finished sculptures. The first step was a thorough scratching with the devil's back scratcher. This removed all the chainsaw and chisel marks, refined the shape of the piece, and left only small scratches to be polished away. We decided to use the scratched texture for the black portion of the realistic penguin and a transparent texture for the white portion and for the entire mechanical penguin (in order to make the machine parts visible). For the transparent texture, we removed the scratches by polishing with a Scotch Brite pad on an angle grinder and applied heat with a weed burner and hair dryer for the final finish. "Scratch, buff, burn" was our mantra for the day. By dinner, both penguins were finished as were all of the machine parts. After a quick dinner, our first priority was assembly of the machine. We had done a trial assembly the day before to verify fit and clearance for all the parts, but the final assembly was a bit different. For one thing, we had to add bushings to keep parts from sliding along the length of axles. We also had to waterglue parts together, eliminating a bit of play between various parts. Once we had everything welded into place, the mechanism didn't work! There wasn't enough clearance for the cam's lug at one end of the slot in the head piece. Fortunately we had anticipated that this might happen, so Lars was able to correct the problem by thinning the lug while I worked on finishing the beak of the realistic bird. The rest of the penguin was done, but we had left the beak for last in order to avoid breaking it. I trimmed an inch or so of diameter with a small chisel and added a beak line and eyes. By the time I was done, Lars had the mechanism working, but he had only tested it with his hands guiding the interior parts. He hadn't actually turned the entire mechanism from the key on the front. We decided to try it together, rotating it a few times just before the final horn sounded. It worked! During clean-up, several people, including sculptors and the event director, stopped by to try it out. We constructed fence posts within reach of the key and a sign instructing people to turn it gently. Sharon made a short video of Lars and I turning it as well. When we left, the mechanism was still working, but we didn't know how long it would last. We crashed at Belfair that night and woke up the next day in time to thaw and dry our equipment before heading out for an 11 mile hike-and-sled to remote Tolovana Hot Springs. It was a delightful weekend of snow, sun, and good company.